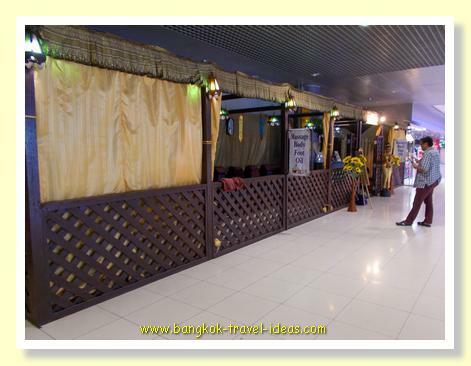 Would you like to relax with the best Thai massage in Bangkok Airport before your next flight? It is good to know that there are a different types of massage at Suvarnabhumi Airport, where you can get those muscles loosened and the knots removed before continuing your flight. A Bangkok Airport massage is one of the treats of visiting Bangkok and even if you just visit for a short period the ready availability of Thai massages is a pleasure that you must experience at least once. 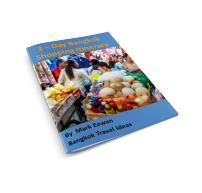 But even if you can’t get out of Suvarnabhumi Airport into the city on a Bangkok layover, or if you just get stuck at Bangkok Airport with some time to kill, then there are still a few options available to help you relax before you take your onward flight, and having a relaxing BKK Airport massage is one of them. 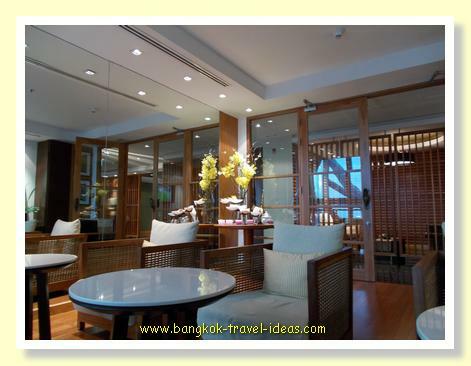 Check out the following locations for a Thai massage next time you go to Bangkok Airport. 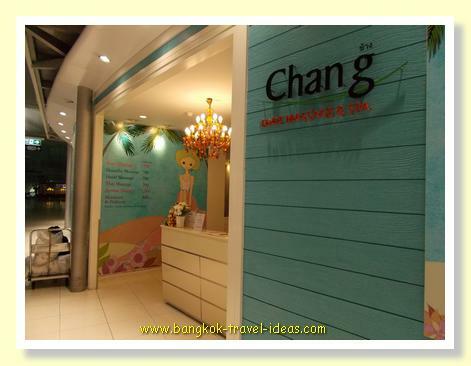 The Express Spa Body and Foot Massage formerly known as Chang Massage and Spa Bangkok Airport is the most well-known and best Thai massage franchise. Express Spa Body and Foot Massage has a range of different massage treatments as well as standard pedicure and manicure options that can be used to while away some time, between or before flights and JCB Credit Card holders are entitled to 10% off regular prices. Why not pamper yourself with an aromatherapy session at Express Spa Body and Foot Massage, whilst the husband looks after the children. 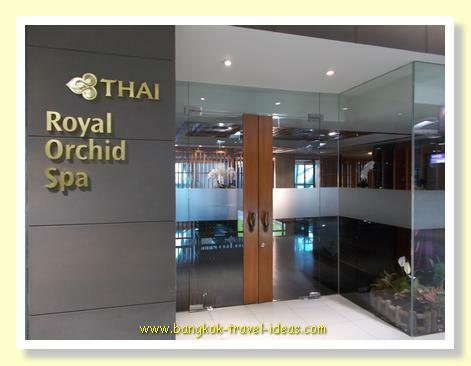 in the Royal Orchid Spa, which is located just across from the Thai Airways Business and First Class lounges in Concourse D.
For those lucky enough to be travelling First Class, then you also have the option of the luxurious full body massage and Thai Airways Spa treatment in the same location. Although Thai Airways do not accept advance reservations for any of the treatments; in my experience once you present at the First Class lounge with your boarding pass, just let the staff know that you would like to have the Thai Massage or treatment option. The Thai Airways staff will be able to book your time slot, just ask about this service when you present your boarding pass at entry to the Thai Airways lounge and they will phone ahead to make your reservation and they will come and get you at the appointed time. For those of you that are Thai Airways Platinum Card holders and entitled to the use of the First Class lounge, then you can also use the above guidance. 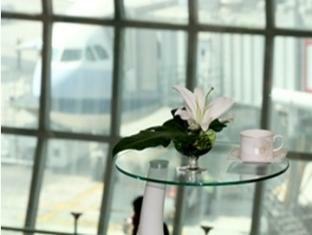 No matter whether you are travelling Royal Silk Class or First Class, the service will be impeccable. Once you arrive at the Royal Orchid Spa, you will be seated and given a welcome drink and a refreshing cold towel. First Class passengers won't have long to wait, particularly if you organised the phone ahead option. Take your turn to experience pure relaxation pleasure, depending upon your choice of service; either neck and shoulder or foot massage. The neck and shoulder massage is my personal favourite, but everyone is different. Afterwards you will be offered a choice of teas and snacks and be seated in the lounge room soothed by relaxing music and visual content. Ginger tea is my favourite, although they have a wide range of options. 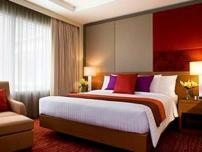 Stay in the Royal Orchid Spa lounge as long as you need. Whether you opt for the simple massage or the full on Spa service you are sure to be relaxed for the next leg of your journey. Best of all, use of the Royal Orchid Spa is complimentary for passengers flying Thai Airways in Royal First and Royal Silk Class. Opening Hours: 06:00 am. - 11:30 pm. You might think that an airport as large as Suvarnabhumi Airport would cater for people who need some relaxation after a long flight and you would not be wrong. For those passengers that have to pass through Immigration and connect to a Domestic flight, then a good way to relax in the meantime is with a remedial massage in Bangkok Airport in one of two locations. There are two locations to choose from on the Airport property, so take your pick. 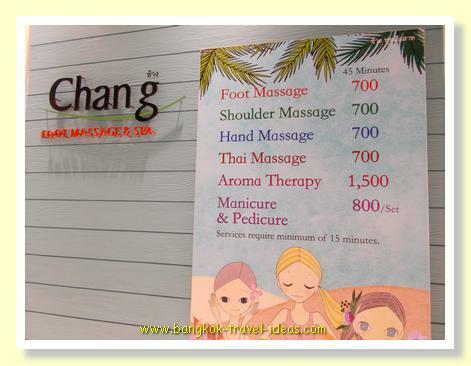 The Bangkok Airport massage price in the Foot Massage and Spa located on the land-side area of Suvarnabhumi Airport are about half of those air-side and the sessions are generally 60 minutes instead of 45 minutes, so you win on both counts. If you have arrived at the airport early to collect your visitors or maybe you are just too early for your check-in, then take the opportunity to have a massage in Bangkok Airport to kill some time. This Bangkok Airport massage is easy to locate and it means that you can have a Thai massage in Bangkok Airport whilst waiting to meet an arriving friend or before you set off on your flight. 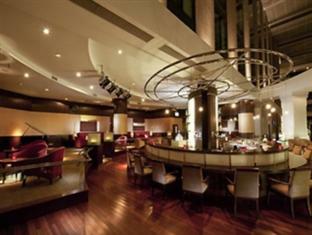 The Express Spa service is located on Level 3 near to the Miracle Lounge and next to the Hair Salon. 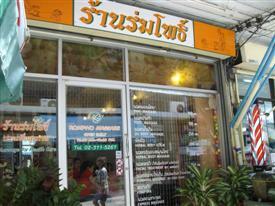 There is a choice of Thai massage services available, that cater for all preferences, so you won't be disappointed. They say that the Suvarnabhumi Airport massage is the best in Bangkok, let me know what you think. If you are waiting to meet an incoming passenger and have some time to spare, consider taking a massage in Bangkok Airport to pass the time. 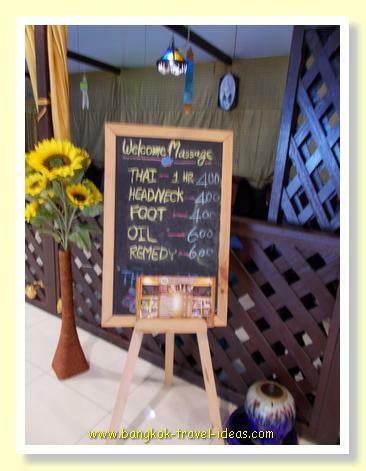 The Welcome Massage offers Thai massage services to Bangkok Airport visitors. 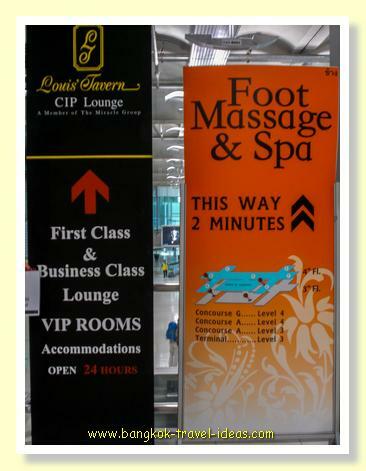 Welcome Massage is down in the lower level of Suvarnabhumi Airport and is located just adjacent to the escalator and on the same level as the Airport Rail Link Train service. Go to the level with the Taxi ranks and then go down one more level. 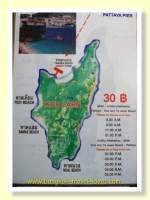 If you need to change some dollars to Thai Baht then you can do that also in this area. 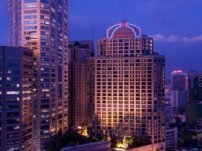 If you have some extra time to spare then shoot on over to the Novotel Suvarnabhumi Airport hotel, you can walk there in about 7 minutes using the underground walkway. Ask the check-in desk about the use of the sauna and massage facilities. The fee will depend upon the service you require. The Novotel Suvarnabhumi Airport has a gym, swimming pool and shower facilities, so this is one of the places that you can come and get a Bangkok Airport shower if you really need to freshen up. 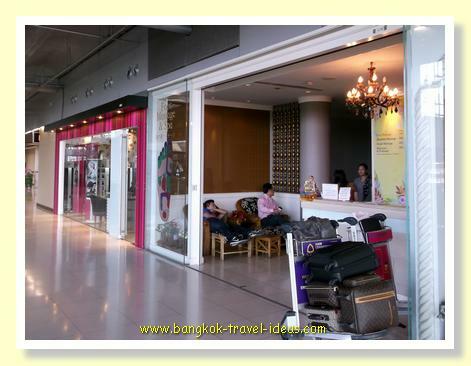 Next time you travel to Bangkok make sure you leave time to have a Thai massage in Bangkok Airport.